Here is a graph of my daily progress in terms of cubic footage. 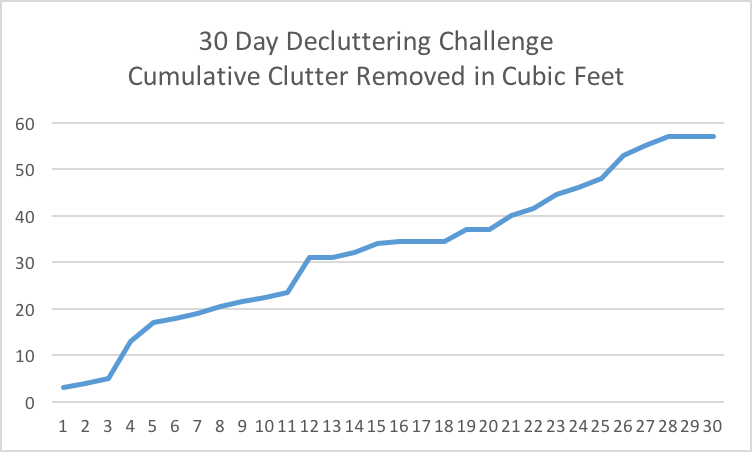 Here is a graph of my cumulative progress in terms of cubic footage. Here is a graph of my daily progress in terms of dollars. Here is a graph of my cumulative progress in terms of dollars. 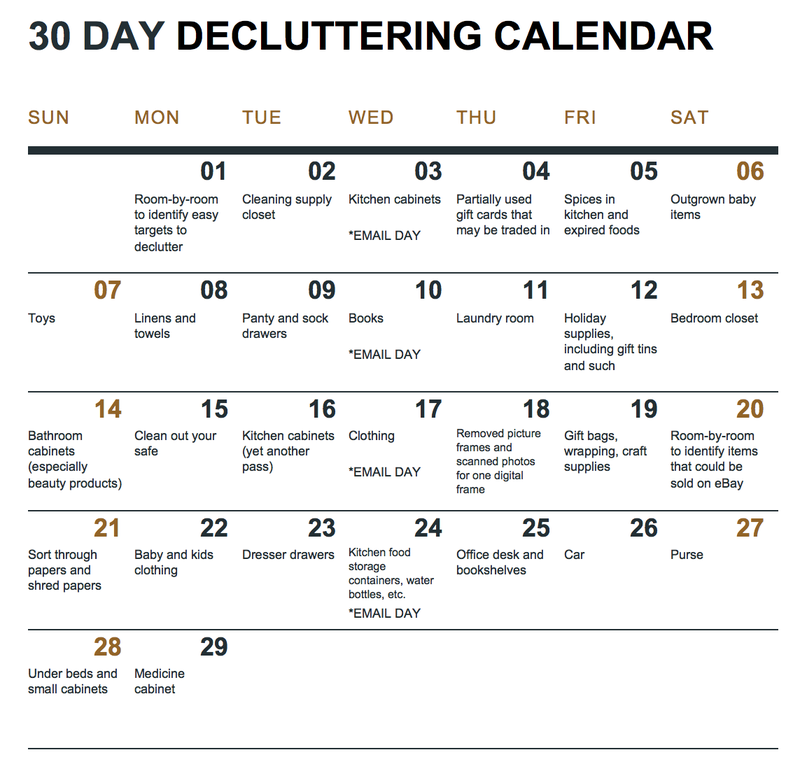 Now that you've seen my progress, let me share my decluttering calendar. In general, I recommend that you do whatever makes sense for your personal situation, but for me, I thought that a calendar like this would be helpful for those days when I felt like, "I don't know what to do today..." You will be able to skim my calendar and see if there is anything that make sense for your personal situation. You will also notice that every Wednesday was an "*EMAIL DAY." Throughout my decluttering, I took photos of items that I was getting rid of and sent weekly photos to family and friends to offer for them to take anything that I was cleaning out. 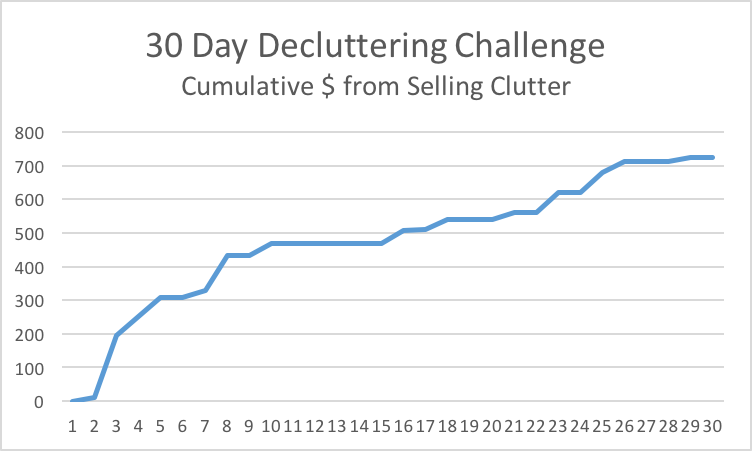 This was a fun way to keep my momentum since others enjoyed being part of my decluttering mission. The clutter cost us space. 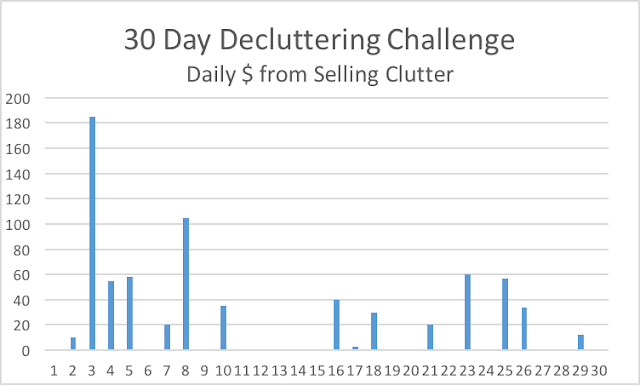 The clutter cost us time in terms of cleaning or even when we needed to search for items that were hidden behind clutter. We even moved clutter from one house to another. 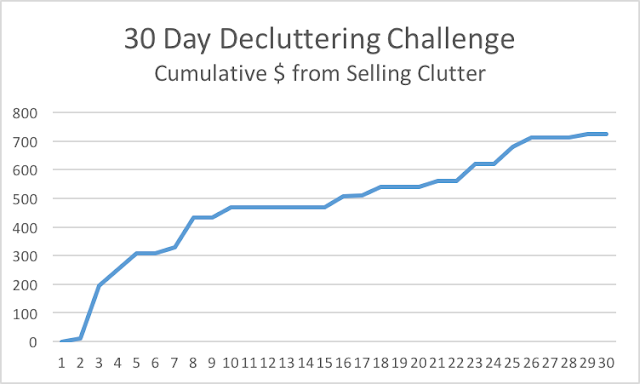 The clutter cost us money as we could have sold many items for more if we sold them when they weren't as old. The clutter cost us a bit in terms of anxiety as we were surrounded by "stuff" and an ongoing thought hanging over us that we needed to declutter. We emailed or texted photos of random items to friends and family to ask if they wanted anything. I'm sure that they thought that I was crazy at times (like, what are you doing with so many Star Wars costumes? ), but they appreciated our thoughtfulness and were kind to support us with the Decluttering Challenge. It was fun when people wanted items. We dropped off donations and appreciated that the items would probably go to good use. We sold items to people who were often excited and appreciated the great deals. 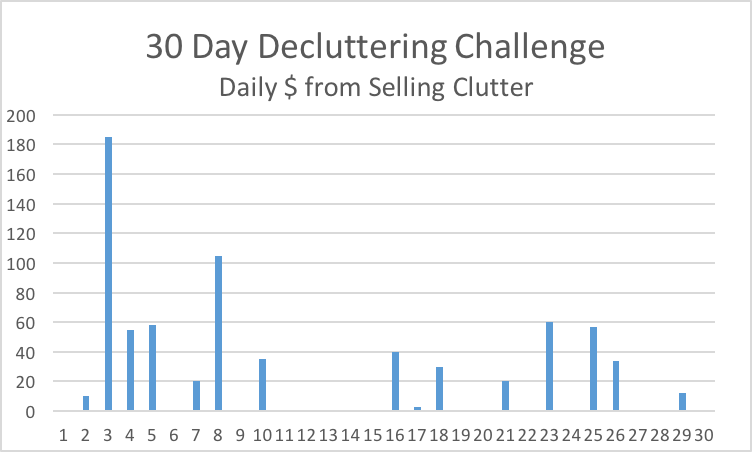 Now that the 30 Day Decluttering Challenge is over, I feel proud of my accomplishments. It was easier to let go of "things" than I imagined. I surprisingly let go over some anxiety too. I'd like to say that we purchase fewer things after the decluttering challenge, but really, our habits were never that excessive. We are just better about letting go of things sooner rather than later. For instance, once my husband finishes playing a video game, he trades it in promptly rather than letting games fill a shelf. Once soccer season is over, we donate the uniform and move on. 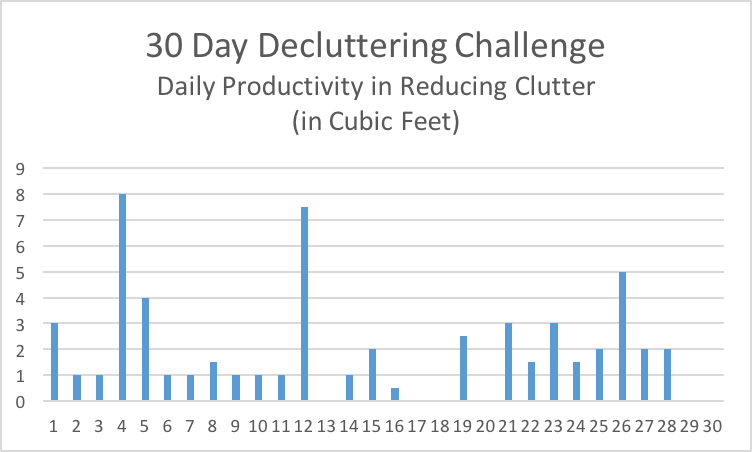 I've also held on to the "consistency" aspect of the challenge, but instead of decluttering for a minimum of 15 minutes/day, I spend a minimum of 15 minutes/day speed cleaning. I set a timer and clean as much as possible in 15 minutes. It's a great way to direct some of my energy! Good luck in your decluttering endeavors. I hope that you find bright spots along the way and feel a sense of accomplishment!